June 18, 2018 at 7:22p.m. Photo by The Vindicator | Lordstown resident Robert Shaffer speaks in support of TJX project during public comment. 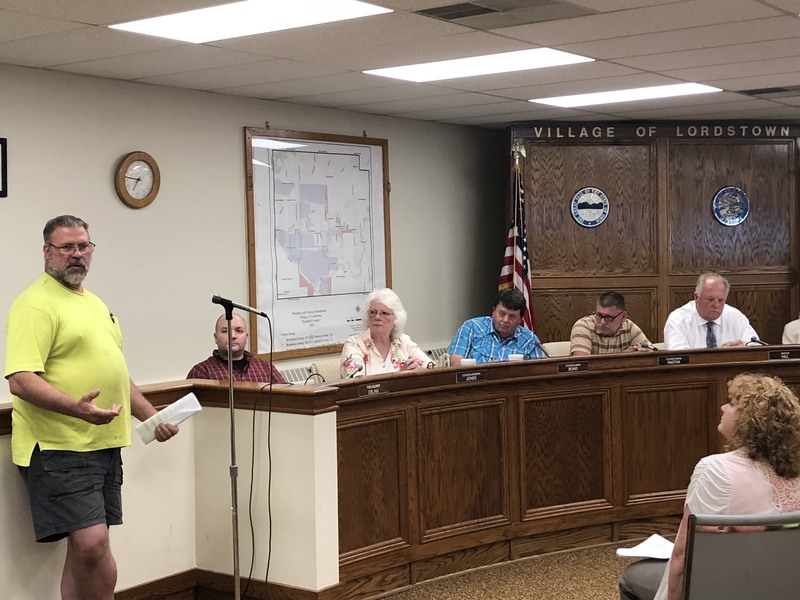 Tonight’s village council meeting drew a crowd of more than 50 people, more than a dozen of whom expressed their opinions on a proposal to rezone land for a TJX project. Council tonight had a second reading of ordinances that would rezone 290 acres on Ellsworth Bailey and Hallock Young roads from residential to industrial for the project. TJX wants to build a $160 million, 1.2 million square foot HomeGoods distribution center there. Many who spoke against the zone changes said they are in favor of the project, but not on residential land. Those who spoke in favor of the zone changes noted the jobs and tax revenue the distribution center would bring to the village. A third reading and vote on the ordinances is slated to take place Thursday. June 16, 2018 4 p.m.
June 18, 2018 9:38 p.m.
June 22, 2018 12:01 a.m.